The 15th Annual Kadir Has Awards were held on Friday, March 22nd in Istanbul, Turkey. Member of the Science Academy, Dr. Ivet Bahar, received the Kadir Has “Outstanding Achievement Award” for her contributions to the development of theoretical and computational models for explaining the functional dynamics of biomolecular systems as well as mentoring and teaching a new wave of scientists. She was presented with the award by the Chairman of the Board of Trustees of Kadir Has University, Mr. Nuri Has, the Kadir Has Foundation President, Mr. Can Has, and the President of Kadir Has University, Dr. Sondan Durukanoglu Feyiz. 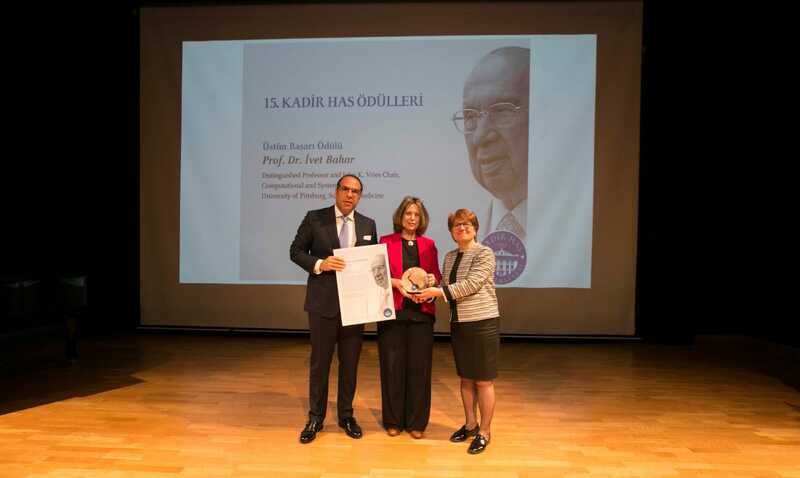 The Kadir Has Awards seek to recognize the outstanding accomplishments that Turkish scientists have made at the national and international level and to promote people and institutions that have contributed to the development of society. For more information, please visit http://kadirhasvakfi.org/en/.